Officially, the Yankees traded Gray and Sanmartin for Long and the draft pick, then flipped Long to the Mariners for Stowers. Based on the timestamps on the press releases, Long was officially a Yankee for nine minutes. The Yankees clear a 40-man roster spot with this deal, which means they won’t have to make an additional move when they announce the Adam Ottavino signing. The Reds were reportedly unwilling to make the trade without signing Gray to a contract extension. The two sides have agreed to a three-year extension covering 2020-22. It is reportedly worth $30.5M. There is also a fourth year club option worth $12M, plus performance bonuses. Add in the one-year contract he already signed for 2019, and Gray’s new deal can max out at $50M across five years. Not bad. Following the postseason Brian Cashman made it clear he was ready to trade Gray. His market took a little longer to develop than I expected, and the Yankees claimed they wanted to hold on to him following CC Sabathia’s heart procedure, but I never really bought it. It was a matter of “when” they’d trade Gray, not “if.” Cashman and the Yankees made it very clear they were ready to move on. Gray, 29, came to the Yankees in a deadline deal with the Athletics in 2017. Things started out fine, but he struggled with his control late that season, then things really fell apart last year. 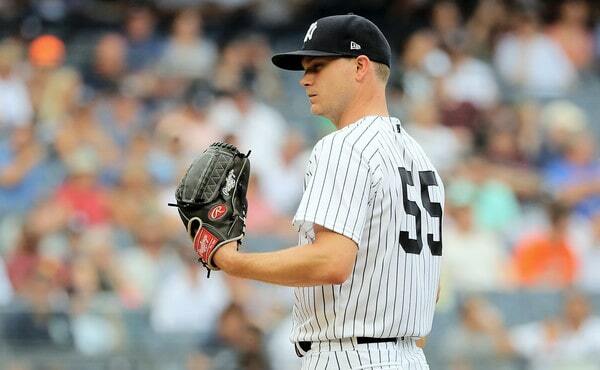 All told Gray pitched to a 4.51 ERA (4.40 FIP) in 195.2 innings in pinstripes. That includes a 6.55 ERA (4.97 FIP) in 88 innings at Yankee Stadium and a 2.84 ERA (3.05 FIP) in 107.2 innings on the road. Sonny didn’t mix well with the Bronx for whatever reason. The 22-year-old Sanmartin came over from the Rangers in a minor trade last offseason and he pitched to a 2.81 ERA (2.71 FIP) with 21.3% strikeouts and 1.5% walks in 67.1 innings at four levels last year. I answered a mailbag question about him recently. Sanmartin’s a stats over scouting report prospect who will probably wind up in the bullpen. The Yankees are loaded with lower level arms and Sanmartin is an easy prospect to trade away. The biggest question in projecting Stowers’ future is whether he can stay in center field, because he needs to improve his reads and jumps … his plus speed is enough for the position if he makes the rest of the necessary improvements. Otherwise, a below-average arm would limit him to left field. Stowers’ bat will likely carry him. He has a plus hit tool, and his sharp batting eye is expected to help him at higher levels when pitchers are around the zone more. With average power, Stowers projects to be able to hit 15-20 home runs per year. Baseball America (subs. req’d) and MLB.com both ranked Long as the seventh best prospect in the Reds’ system before the trade. Based on the little I know about Long and Stowers, my preference would’ve been to hang on to Long, mostly because I prefer infielders to outfielders and upper level players to lower level players whenever possible. Stowers is just getting his career started and is a few years away. Long might play in MLB this coming season. Shrug. The draft pick is a pretty big deal. Competitive Balance Round picks are the only draft picks that can be traded — this is the first time the Yankees have ever traded for a pick — and, right now, the draft pick is 36th overall. It could move a little in either direction as the remaining qualified free agents sign, though it’ll be in the mid-30s. The Yankees get the draft pick and the bonus pool money associated with the pick. Last year the 36th overall selection had a $1.97M slot value. An extra pick and all that extra bonus pool money equals more talent for the farm system this summer. According to my quick math the Yankees’ luxury tax payroll is down to $221M this coming season, which is below the $226M second luxury tax tier. Realistically, there’s no way they can get under the $206M threshold at this point. Staying under the $226M threshold and avoiding the surtax is definitely doable and it wouldn’t surprise me if that’s the goal. A Manny Machado or Bryce Harper signing has felt unlikely for weeks and this trade doesn’t change that. Aside from a surprise Machado or Harper signing, the only thing the Yankees really have left to do this winter is replace Gray with another swingman/spot starter type. I’d bet on that pitcher making much less than the $7.5M the Yankees were slated to pay Sonny this season. I’ve mentioned Francisco Liriano a few times as a personal favorite for that swingman role. Looking over the list of free agents, others like Jason Hammel and Drew Pomeranz could be swingman candidates. We’ll see.